You ladies know I get spoiled on a daily basis having the best job in the world… And, as much as I’m not jaded about all the freebies I receive, it takes a lot for a skincare line to completely take over my vanity (with a few complementary exceptions, which I will get to in future posts). When I was writing my story Naturals 2.0 for the San Francisco Chronicle, I was introduced to Hillary Peterson, CEO and Founder of True Nature Botanicals (TNB) and I was completely blown away by her story and the brand. Peterson is a cancer survivor who was determined to create luxurious results-driven non-toxic skincare. I can affirm — mission accomplished. Keep in mind that when I met Peterson, I had already visited at least 3 or 4 other ‘next generation natural’ brands (by next generation I mean high-performance lines backed by and formulated with green chemistry) which were adorning my vanity. But, when I started playing with the beautiful TNB products, I simply fell in love and I found that the brown glass TNB bottles quickly occupied almost every step in my skincare routine. The TNB product line literally makes me giddy for my nighttime skincare ritual. Now, these products are luxurious to use because they smell and feel AMAZING, but the true beauty of the line lies in its performance. My skin has never been smoother, plumper and more even (read: less temper tantrums). Another standout is the TNB Pacific Topical Vitamin C Treatment, which makes me feel like an alchemist every other night (when I’m not doing retinol) as I open the capsule of powdered vitamin c and sprinkle it in the super-nourishing Pacific Face Serum ($140). 1) 2-3 times a week I start with the Pacific Exfoliating Cleanser (yeah that’s right, gentle enough even for my overly sensitive skin) which combines a patented mushroom extract with a gentle exfoliator. 2) Then I spray the unbelievably heavenly-smelling Pacific Mist ($48) way too generously (I’m terrified I’m going to run out soon!) to hydrate and breathe in the neroli-scented (naturally of course) deliciousness. Of course I can’t help myself from misting myself every time I walk by my vanity. 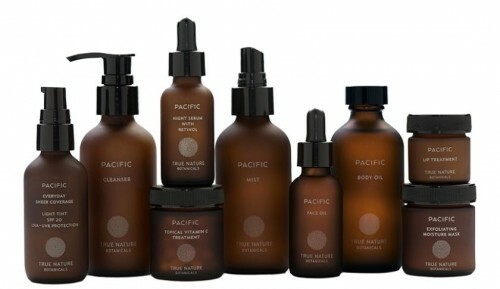 3) Then I pat and press into my face the Pacific Face Oil ($110), a combination of active oils and Marine Essential Fatty Acids. 4) If it’s daytime, I finish with sunscreen (obviously) and nighttime I either use the retinol serum or Face Serum + Vitamin C capsule combo. So, I know the line is a little pricey, but I can assure you that there is good reason (and that I’m not getting paid to write this). There is zero filler here — you are getting nothing but active naturals and non-toxic ingredients in the most luxurious products imaginable. And guess what? TNB is giving my readers a 15% discount for the next week! So go ahead and spoil your skin and get 15% off your entire True Nature Botanicals order for a limited time by entering promo code BINGE at checkout.